Established 25 years ago, Benkling has quickly evolved from being the middle man in the engineering sector to a fully fledged manufacturer, focusing on medium-to-heavy fabrication, castings and forgings for the mining and railway industries in sub-Saharan Africa. More than just a provider of parts, Benkling offers a reliable and cost-effective service which has resulted in excellent working relationships with its customers. We pride ourselves on being a supplier that is able to provide a total solution from beginning to end. By investing its resources in new products and the latest technology in this field over the last few years, Benkling has secured not only a loyal client base but also a growing one. Clients are guaranteed quality products that conform to ISO9001 standards. 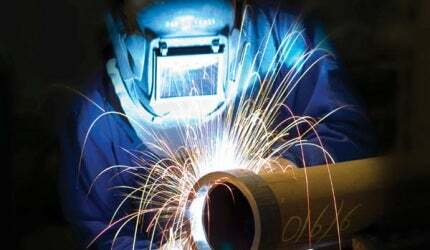 Fabrication is Benkling’s core business, with a fully flexible approach to its customers’ manufacturing requirements. We have many years’ experience in providing products for use in the mining and railway industry, thereby providing our customers with the peace of mind that we are able to provide products which are both standard and specific to their needs, as well as services that meet their requirements. With 4500ft² of factory and 45 staff we offer a one-stop fabrication service from laser or high-definition cutting to CNC precision bending and plate rolling. We have the operational capacity, expertise and skills necessary to undertake highly complex steel fabrication projects. Benkling prides itself on being able to offer its clients a range of welding services to meet their needs, from C02, Tig, Mig and stainless-steel welding to more specialised welding such as submerged arc welding. All our welders are certified according to the AMSE 9 and constant updating and training is done to ensure the standard of welding meets the code’s requirements. The company understands clients’ various needs and requirements and its service delivery is based on not only its flexibility but also by creating efficiencies in terms of costs and lead time. In an effort to reduce the need to outsource, Benkling has established its own in-house machining division consisting of CNC milling machines, CNC lathes and radial arm drilling machines. This has resulted in Benkling offering an improved service and better lead times to its clients. Benkling offers a complete engineering sourcing facility, which includes imported commodities from global markets. Through our robust supplier base, we offer a wide range of ferrous and non-ferrous castings, from lost wax investment castings to more conventional sand castings. Quality is of the utmost importance and all products are manufactured and conform to ISO 9001 standards. To find out more about Benkling’s products and services, please contact us using the details or form below.